Vancouver, B.C… Corvus Gold Inc. (“Corvus” or the “Company”) - (TSX: KOR, OTCQX: CORVF) announces assay results from five additional core drill holes from the ongoing 2013 drill campaign at the Yellow Jacket target, North Bullfrog Project, Nevada (Figure 1). 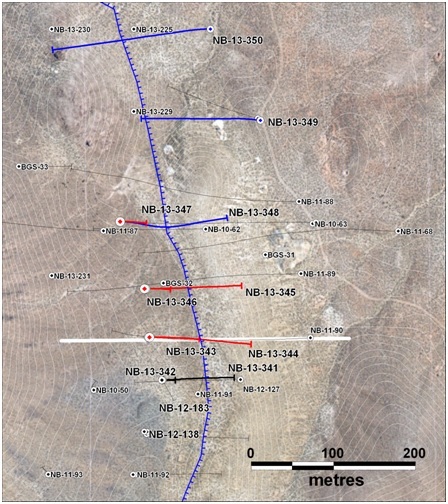 Characteristics of mineralization identified in drill holes NB-12-138, NB-13-344 & NB-13-347 indicate the potential of a high-grade starter pit zone that can be incorporated into the Sierra Blanca deposit (Figure 3). Upon conclusion of the current drill program, an updated resource calculation is scheduled for release late 2013 with an updated PEA anticipated early next year. Drill hole NB-13-347, intersected 13.8 metres of 7.2 g/t gold and 21.0 g/t silver, including 1.7 metres averaging 8.5 g/t gold and 256 g/t silver. It represents a 260-metre step-out north of 2012 discovery hole NB-12-138 with a core of 4.3 metres @ 20.0 g/t gold & 1,519 g/t silver and 140 metres north of hole NB-13-344 with a core of 8.3 metres @ 10.7 g/t gold and 10.4 g/t silver (Table 1). Only 43 metres of assays have been returned from hole NB-13-347 with the remainder expected next month. These thick high-grade cores zones are part of much broader zones of 50 to 80 metres averaging over a gram per tonne with high silver credits and form a very attractive open pit mining target. The high-grade feeders appear to be occurring on regular intervals like fingers on a hand along the north trending Yellow Jacket Zone and may represent the upper levels of a larger high-grade system at depth. The Yellow Jacket system has only been tested at relatively wide spacing in the top 150 metres and remains open along strike and at depth. These feeders are surrounded by lower grade stockwork and disseminated zones and can be fully exploited with open pit mining. In addition, hole NB-13-343, which is on the same section as NB-12-344, and hole NB-13-346, which lies halfway between NB-13-344 and NB-13-347 returned thick moderate grade intercepts which reflecting the surrounding disseminated and stockwork style of mineralization and confirm the continuity within the overall broad structural zone. 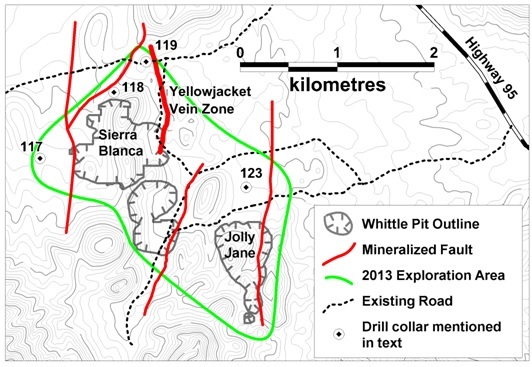 Figure 1: Location of Yellow Jacket diamond drill holes. Red traces indicate holes reported in this press release. Blue indicates assays are pending. For a more general location of Yellow Jacket see Figure 2. Table 1: Significant intercepts* from recent core holes at Yellow Jacket. *Intercepts calculated with 0.1g/t cutoff and up to 1.7m internal waste. Corvus controls 100% of its North Bullfrog Project, which covers approximately 70 km² in southern Nevada just north of the historic Bullfrog gold mine formerly operated by Barrick Gold Corporation. The property package is made up of a number of leased patented federal mining claims and 758 federal unpatented mining claims. The project has excellent infrastructure, being adjacent to a major highway and power corridor. The Company’s independent consultants completed a robust positive Preliminary Economic Assessment on the existing resource in December 2012.